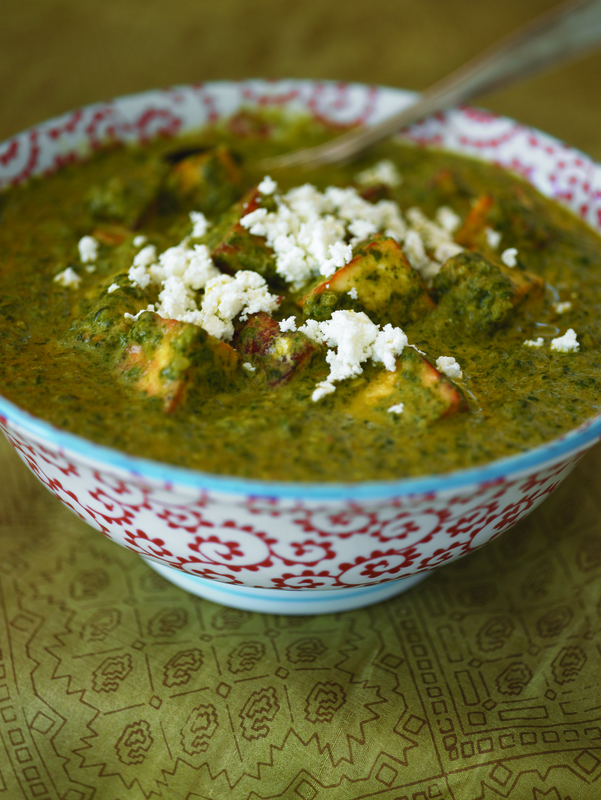 Cut Paneer into 1-inch cubes; set aside. Add enough ghee to equal 1 inch in depth in skillet; heat over medium-high heat to 375ºF. Add Paneer cubes and cook until lightly golden. Remove cubes from skillet with strainer and plunge cubes into boiling water; drain after 5 minutes. Place cubes in bowl and coat with yogurt; set aside. Add 4 tablespoons ghee to 4 quart saucepan and heat over medium heat; add onion, garlic, ginger, coriander, cumin, garam masala, turmeric, chile flakes and cayenne pepper and cook until onions are translucent and light pink in color. Add a little water if mixture begins to stick to pan. Stir in chopped tomatoes and minced green chiles; cook for 5 minutes over medium heat. Add spinach and salt to taste; cover and cook over medium heat 5 minutes. Remove from heat and cool. Place mixture in blender and blend for 5 seconds. Do not puree. Return mixture to pan and heat over medium heat; add reserved Paneer cubes and butter. Cook 10 minutes over low heat. Add water if necessary. Remove from heat; add cream and serve. Makes 8 servings. Serve with 6 cups prepared Basmati Rice.